Mojave, California. 15 April 2019. 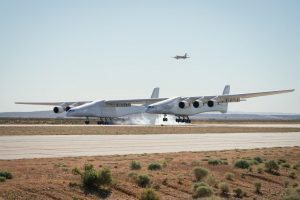 The largest plane in the world took off in the Mojave desert of the United States. 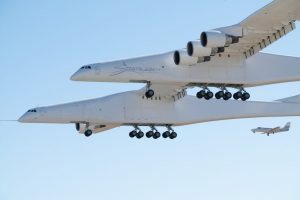 Stratolaunch has got six engines, two fuselages and a wingspan wider than a football pitch. Developed by Microsoft co-founder Paul Allen, the plan is to strap rockets under the wings, fly to 35,000 and then release them. The airplane has been named Roc. 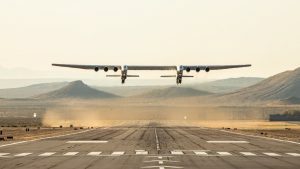 It took off at 6:58 a.m. PDT (9:58 a.m. EDT; 1358 GMT) and stayed aloft for 2.5 hours, as per the Stratolaunch statement. It reached a peak altitude of 17,000 feet (5,180 m) and a top speed of 189 mph (304 km/h). Indian’s defence budget accounts for nearly 17.2 per cent of the total central government expenditure for the year 2016-17.